As the Charles Lloyd Quartet began the second half of a two-night engagement at Yoshi’s Oakland on Thursday evening, their music seemed to coalesce from nothing, gathering itself and rolling into the room like billowing fog from a gray, choppy sea. The house was packed to capacity, but Lloyd’s august presence seemed to radiate throughout the club, creating a sense of warmth and inner stillness that allowed his band’s surging creativity to burst forth. This band – with the dazzling Jason Moran on piano, eloquent Reuben Rogers on bass and elemental Eric Harland on drums – is widely regarded as one of the heaviest combos in jazz, and they proved it time and again on this night. 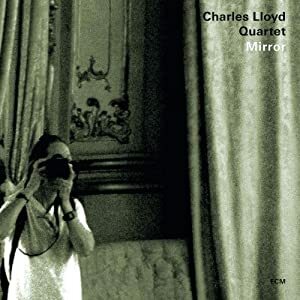 Focusing on music from their new ECM release, Mirror, the group found brought renewed vividness to Lloyd’s established repertoire of standards and originals, performing with fathomless depth, naked emotion and a profound sense of spirit. Click here for the full review at The Jazz Observer. The ambience and the material -- a collection of Lloyd originals, a few spirituals such as "Go Down Moses" and "The Water Is Wide," and a smattering of cover tunes (by Thelonious Monk and the Beach Boys' Brian Wilson) -- are similar to two other landmark Lloyd albums: 2000's "The Water Is Wide," a joint project with his dying friend, drummer Billy Higgins, and 2002's "Lift Every Voice," a response to the 9/11 tragedy. The thread that connects them is "the need and the call for some tenderness," said Lloyd. But what really elevates "Mirror" is the exquisite synergy of his latest quartet, which might be the best working ensemble of his long career. Click here for the full review of Mirror at The Star Tribune. "The group played one standard, “I Fall in Love too Easily,” and one had the sense that the quartet was listening and communicating deeply. Some of the tunes seemed familiar, some were new to me. Two numbers go all the way back to Lloyd’s time with Chico Hamilton—“Passin’ Thru,” and “Forest Flower,” which was the finale. And who wouldn’t want to hear that? This was a very memorable evening!"